Maryland Will Yeatman once an NFL prospect our of southern california put the pads on this season at Maryland, but is lacrosse in his future? Dave Cottle ( ex of Maryland Lax) is headed to Harvard ? 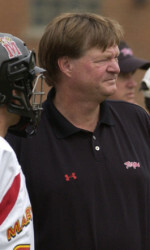 The rumor out in the Laxsphere is that Dave Cottle ex- of U of Maryland lacrosse, is headed to Harvard ! I don’t get it.. I thought Cottle left Maryland to take it easy, and now he’s going to head to the m ost prestigious school in the world and try to m ake them into a powerhouse…What am I missing in this story ? Can someobody help me out there ?